McCafe Decaf Premium Roast Coffee is a smooth and balanced medium decaf roast. This medium decaf roast coffee is an approachable blend with a fuller body but without the extra caffeine, perfect for savoring the great taste of coffee without the extra energy kick. McCafe decaf coffee is made with 100% Arabica beans. Arabica beans are widely recognized for their superior flavor, smooth body and rich aroma versus other decaf coffee. Roasting coffee beans requires the right balance of time and precise temperature to convert coffee's naturally occurring sugars and starches to rich decaf coffee. 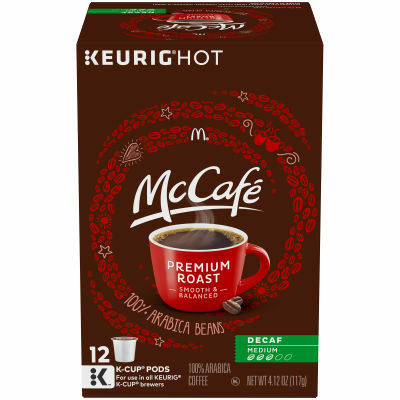 McCafe K Cup Pods brew up to 12oz of decaf coffee and are compatible with Keurig K Cup Pod Coffee Brewers. With McCafe K Cup Pods, you can enjoy a perfectly balanced cup of smooth decaf coffee.